To create effective data visualizations, you must be part statistician, part designer, and part storyteller. In his bestselling book Visualize This, Nathan Yau introduced you to the tools and programming techniques for visualization. 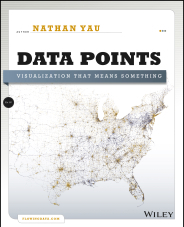 Now, in Data Points, he explores the thinking process that helps you create original, meaningful visualizations that your audience will both understand and remember. Here's how to make your data mean something.